What's The Best E-Cigarette Starter Kit? To make things as simple as possible, we'll list the best e-cig kits by brand, which will allow you to quickly compare them by features, price, etc. NOTE: Every starter kit listed below has earned high ratings from vapers who have used them. 3 V2 Batteries, 25 V2 Flavor Cartridges (your choice of nicotine strength & flavor), 1 Wall Adapter, 1 Smart Charger, 1 Car Charger, 1 Portable Charging Case XL, 1 Power-Cig, 1 Metal Carry Case, 1 V2 Lanyard, 1 V2 Manual, & a Lifetime Warranty. 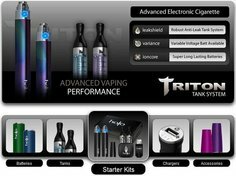 2 Manual Halo Triton Batteries (each in your choice of 400 mAh or 650 mAh), 2 Crystal Clear Triton Tanks (clearomizers), 1 Triton Cone (the color matches your kit color), 1 USB Adapter, 1 Wall Charger, 1 Halo Triton Carry Case, and the Halo product Warranty (Battery - 60 days, Wall Charger - 90 days, USB Adapter - 90 days). 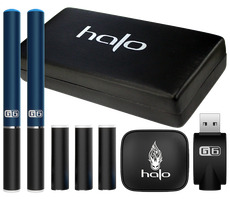 2 G6 batteries (each in your choice of Manual or Automatic and 65mm or 78mm), 1 Cartomizer 5-Pack (your choice of nicotine strength and flavor), 1 USB Adapter, 1 Wall Charger, 1 Halo G6 Carry Case, and the Halo product Warranty (Battery - 60 days, Wall Charger - 90 days, USB Adapter - 90 days). 1 Lavatube Version 2 in your choice of color, 1 Black cushioned Lavatube Carry Case, 1 AW IMR 1600 mAh High Drain 18650 rechargeable LiMN battery, 1 XTAR WP2 II multi-charger, 1 7ml Chrome Tube Tank Vapor Delivery System with 3.0 ohm plastic cartomizer and plastic drip tip, and 1 15ml bottle of USA-made Premium E-Liquid (in your choice of nicotine strength and e-liquid flavor), and 1 Year Warranty. 1 V2 Automatic Battery, 1 V2 Manual Battery, 10 V2 Flavor Cartridges, 1 Wall Adapter, 1 Smart Charger (prevents overcharging and charges your battery twice as fast), 1 V2 Manual, and a Lifetime Warranty. 2 Automatic Batteries, 4 Flavor Cartridge 5-Packs (20 flavor cartridges - each 5-Pack in your choice of nicotine strength and flavor), 1 VC Clutch, 1 VC Lanyard + Charm, 1 Mini Smart Charger, 1 Wall Charger, 1 Manual, & a Lifetime Warranty. 1 Gift Box, 1 650 mAh Pass-through Inferno Battery w/5-Click power on/off, 1 900 mAh Pass-through Inferno Battery w/5-Click power on/off, 1 Wall Charging Adapter, 1 Mini USB Cable, 1 Tube Tank setup with (1) 1.5 ohm cartomizer & plastic drip tip, 5 Refill 1.5 ohm cartomizers, 1 Tube sock, 1 15ml bottle of USA-made Premium E-Liquid (in your choice of nicotine strength and e-liquid flavor). 2 Smokeless Image Volt Batteries (each in your choice of color, size and LED light color), 2 Volt 5-Pack Cartridges (each in your choice of nicotine strength and flavor), 1 Volt Charging Case Kit (choice of Volt Slider or Mega Charging Case), 1 USB battery charger, 1 USB Wall Adapter, 1 USB Pass-through, and a 3-month Warranty. UPDATE: We're in the process of updating this page to include detailed information on ALL of the above-mentioned starter kits. ...Detailed information on following e-cigarette starter kits and their available options, performance evaluation, warranty, etc. As the all-time favorite of most vapers, the new V2 Ultimate Kit is, quite simply, as good as it gets (see our full review here). The V2 Ultimate Kit offers pretty much everything and anything vapers want these days. And along with excellent quality and vaping performance, the V2 Ultimate Starter Kit also comes with a full Lifetime Warranty. Yeah, you can't beat that! Note: The V2 Ultimate Kit comes with everything the V2 Standard Kit comes with, plus a whole lot more. This is why the Ultimate Kit is our overall favorite among all e-cigarette starter kits. It comes with everything today's vapers desire in a top-quality e-cigarette starter kit. 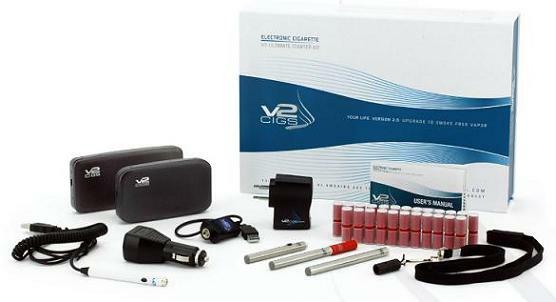 In addition, the V2 Ultimate Kit also comes with the totally awesome V2 Power-Cig. And trust me, the Power-Cig (a USB powered e-cigarette) totally rocks! Honestly, we can't say enough good things about it. The Power-Cig may, very well, become your favorite vaping device for at-home use. We sure know it's become ours! 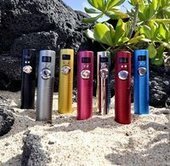 V2 Power-Cig - The V2 Power-Cig is a wired e-cigarette that you can use at home with any computer or electronic device that has a USB port. With the V2 Power-Cig, there's no need to worry about batteries. Simply plug it into any USB port and you're ready to vape! NEW V2 Smart Charger - The new V2 Smart Charger has an internal computer chip that allows you to charge your e-cigs twice as fast. The computer chip also prevents overcharging. NEW V2 Car Adapter (2 amp) - Charge your V2 e-cigs and your V2 Power-Cig (included in the V2 Ultimate Starter Kit) while you're in your car. The car adapter works with your V2 Smart Charger...so you can charge your V2 e-cigs from any 12v DC outlet. NEW Portable Charging Case XL - Charge your V2 e-cigarettes anywhere! The V2 Portable Charging Case is like having an electrical outlet right in your pocket. It's not only light and easy to carry, but also allows you to charge an electronic e-cigarette battery up to 8 times before it needs to be plugged into a wall outlet. The V2 Portable Charging Case XL also has enough space for you to carry 3 flavor cartridges and 1 charging battery (any length). The V2 Ultimate Kit offers you a lot of customizability, especially when it comes to your e-cigarette batteries. For example, you can choose your preferred battery color, battery length, and even your battery switch type (automatic or manual). The V2 Ultimate Kit offers several different flavor choices (all of which are pretty darn delicious!) and nicotine level options. And in case you're in a quandary, we'll note that the Coffee flavor and the Menthol flavor are especially yummy! Choose the flavor and nicotine strength you like. 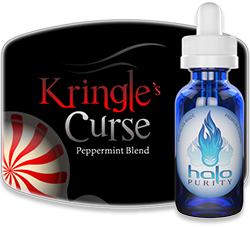 There are many delicious flavors to choose from, as well 4 different nicotine strengths (Full, Medium, Light and Zero). Lifetime Warranty - V2 Cigs offers a full Lifetime Warranty on all purchases made through the v2cigs.com website. They guarantee that your V2 Cigs product will be free from defects, both in material and workmanship, for the full life of the product. 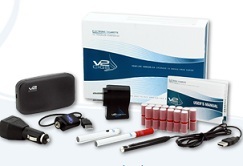 Check out the V2 Cigs Ultimate Starter Kit here. The Lavatube Version 2 is unquestionably the best variable voltage e-cigarette on the market today. Outperforming its rivals (both in performance, and in looks), it truly earns the title of the most advanced variable voltage e-cigarette available to vapers today. That, and it's also the all-time favorite. NOTE: For full details (and more pics), see our Lavatube Version 2 Kit review here: Volcano LAVATUBE Version 2 Kit Review - Awesome or Not? 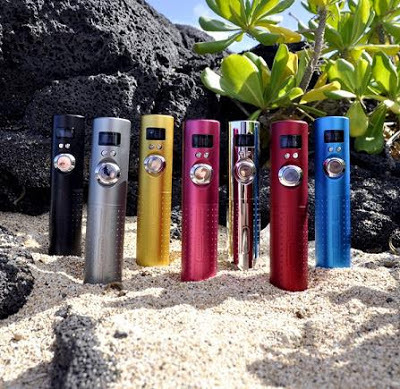 With its superior vapor production (and consistency), the Lavatube Version 2 by Volcanocigs just can't be beat. When it comes to variable voltage e-cigarettes, the Lavatube Version 2 is in a class all its own. So do yourself a favor and check it out! You can do so by going to the official Volcanoecigs webpage for it, or by reading our full Lavatube Version 2 review here. Check out the Lavatube Version 2 Kit here! The V2 Cigs Standard Kit comes with everything you need start vaping right away, so you can finally quit smoking tobacco cigarettes immediately...and completely. The V2 Standard Kit also comes with the V2 Smart Charger (a USB charger). The Smart Charger has an internal chip that charges your batteries twice as fast, and also prevents overcharging. One particular highlight of the V2 Cigs Standard starter kit is the V2 Smart Charger (USB charger). The Smart Charger is a USB charger, so it'll allow you to charge your e-cigarettes via any standard USB port, whether that be your laptop, your desktop computer, XBox, PlayStation 3, etc. Bottom line, if it's got a standard USB port, it'll charge your e-cigs. And that's pretty damn awesome. Of course, the V2 Standard Kit also comes with the V2 Cigs Lifetime Warranty, which guarantees that your V2 product will be free from defects in material and workmanship for the full life of your product. The V2 Standard Kit also offers several different customizable options, especially when it comes to your batteries (you get a manual battery as well as an automatic battery). V2 Cigs offers several different flavors and nicotine strengths, all of which are pretty damn delicious. We should probably note that the Coffee flavor and the Menthol flavor are especially yummy! The V2 Standard Kit is excellent, and there are no two ways about. 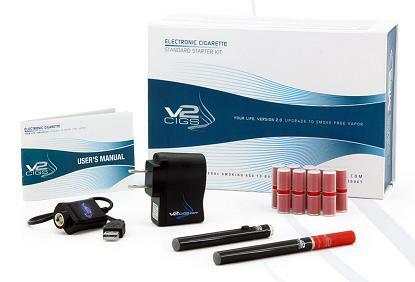 As far as entry-level e-cigarette starter kits go, the V2 Standard Kit is by far the best we've seen to date. It combines both great value and great performance, all in one awesome e-cigarette starter kit. 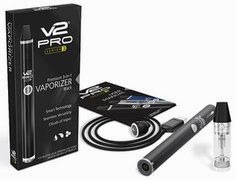 In fact, the only way to beat it is to spend a little bit more and get one of the other V2 Cigs starter kits, like the V2 Couples Kit, the V2 Traveler Kit, or the V2 Ultimate Kit, for example. So yeah, the V2 Standard Kit is definitely a winner. Check out the V2 Cigs Standard Kit here. 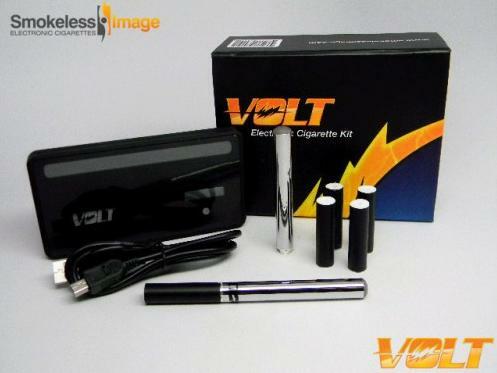 The Smokeless Image Volt Pro starter kit is an ideal e-cigarette starter kit, especially for vapers on the go. The Volt Pro comes with everything you need to charge your batteries while you're out and about. The Volt Pro Starter Kit comes with a slimline charging case that easily slips into your pocket, allowing you to charge your e-cigarette batteries while you go about your day. 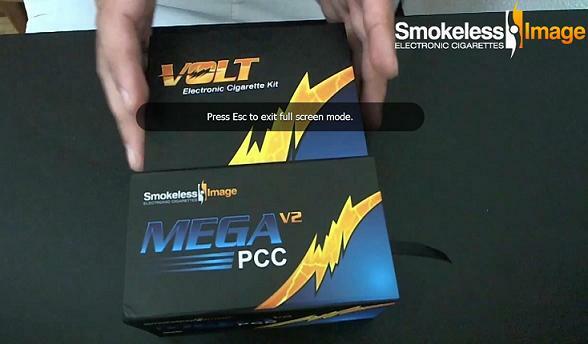 Smokeless Image gives you several different options with the Volt Pro starter kit, so you can pick and choose what comes in your kit, and tailor it specifically to your liking. NOTE: See our full Volt Pro Starter Kit review here! Check out the Volt Pro Starter Kit here. 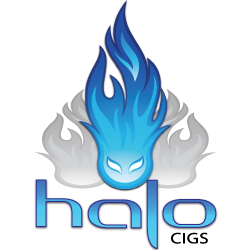 The INFERNO Kit from Volcano Ecigs offers awesome vapor production, as well as very long battery life. The INFERNO e-cig is the largest e-cig offered by Volcano. It comes with the famous Tube Tank (loved by vapers!) and your choice of 5 different e-cig battery colors. The larger battery size of the INFERNO means three things: awesome battery life (up to 15 hours between charges! ), awesome vapor production, and superb performance overall. 1-Year Limited Warranty - Volcanoecigs offers a 1-year limited warranty against defects in workmanship and materials for most of their e-cig products. The 1-year warranty covers: batteries, chargers and charging packs. 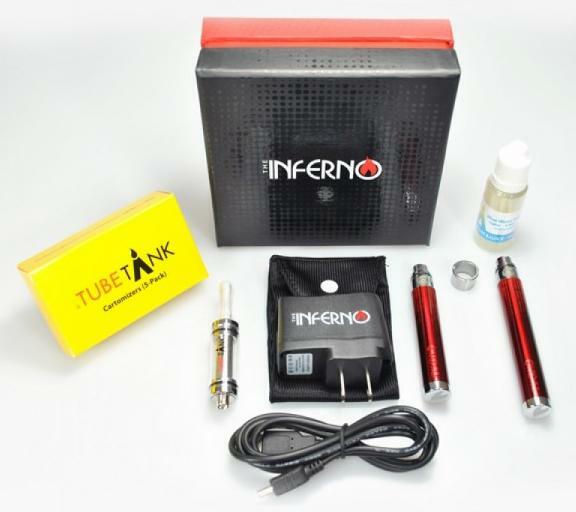 Check out the INFERNO Starter Kit here. NOTE: E-cigarette products change from time to time. 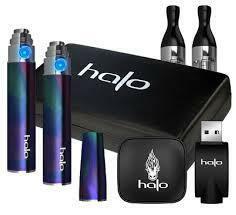 Please refer to the company websites for the most current e-cig products, prices and availability.